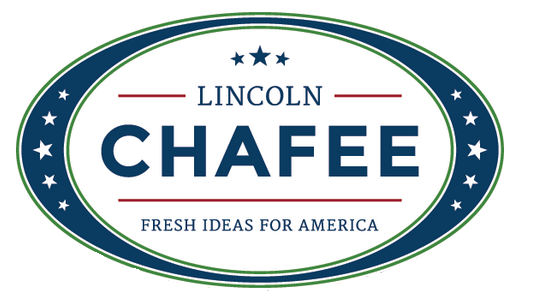 Continuing the endless string of “Who?” we find ourselves at Lincoln Chafee. Chafee is a former Rhode Island governor who’s running under the Democratic banner this cycle. Unlike most politicians who party-swap, Chafee spent a respectable six years as an Independent after his initial eight year Republican stint. But you folks are here to see the garish branding, right, so here we go! Where’s the horror? There was supposed to be horror! While it hasn’t the elitist stoicism of your current brand that’s a good thing. It has a more open and inviting tone; an inclusive element that makes you one of the people instead of some career politician who’s too good have a beer with his constituents. And a slogan that’s so stale it’s actually fresh again! And like many of our other designs in this series it has a built in smaller element that’s easily separated from the whole. Place that spiffy “lc2016” at the top of your letterhead and suddenly you’re a going concern, Linc! For you young designers that wonder where genius like this lower case design comes from, we’ll tell you! In this case [See what we did there?] it came from the initials of Lincoln Chafee: LC. Or lc for lower case! Aren’t we clever? The question for Lincoln, though: Is your campaign clever enough to give us a ring?